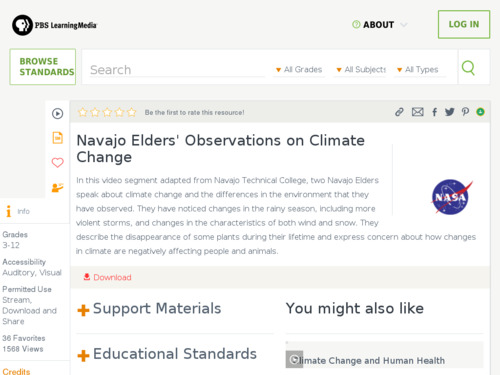 As part of a unit on climate change, students could research observations by indigenous people from varied locations. The two Navajo Elders' observations include changes in the rainy season, more violent storms, and changes in the characteristics of both wind and snow. They describe the disappearance of some plants and express concern about how changes in climate are negatively affecting people and animals. Comments from expert scientist: The video of the Navajo Elders is great. They are presenting their observations over time. A Background essay and discussion questions are provided. Grainy when viewed online in fullscreen. Best to download and watch on laptops.